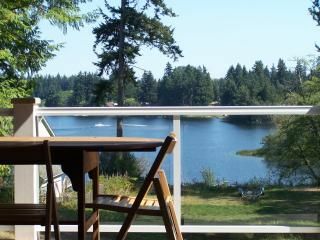 Beautiful waterfront lake home located on the South end of Whidbey Island. Enjoy a cup of coffee with a beautiful sunrise over the lake every morning and your favorite beverage or glass of wine in the evening from the upper deck. Cozie up to the fireplace in the winter with a nice cup of Cocoa. Open floor plan with full kitchen and Lake views from every room in the house. This home includes a dock and an indoor sports court. Just minutes from the quaint waterfront town of Langley. Master bedroom includes 3/4 shower bath, with second bedroom and full bath on second floor. A cute third loft bedroom is also accessible by a pull down stairs for parties over four. Come relax, play and enjoy everything this place has to offer. Great place for a short retreat, special occasion or a week long re-charge. This is a wonderful place to bring your family. Great grassy yard for kids to play, with all the water activities as well. Note: main living area is on upper floor level. Loft bedroom is not suitable for small children. Beautiful Lakeview Property with a view from every room. Wheelchair accessible only at lower floor level. Main living is upstairs. Very nice get-away with beautiful view and a great gym we couldn’t drag the kids away from! Great location, so close to our bonfire celebration. Thank you so much Barb! I hope you all had fun! My family and I really enjoyed our vacation on Whidbey Island -- especially our stay at this wonderful little house. We enjoyed waking up to the serene view, paddling on and swimming in the lake, and eating out on the deck. Since we planned on going in to Seattle during out stay, we especially appreciated the proximity to the Mulkilteo ferry. As other reviewers mentioned, I too felt the kitchen was a little understocked (compared to other vacation rentals I've stayed in) and I was mildly frustrated that I had to purchase so many household essentials (such as paper products and soap for bathrooms and dishwasher). But those are minor items. All in all a good value for a great place to stay. As other reviewers mentioned, I too felt the kitchen was a little understocked (compared to other vacation rentals I've stayed in) and I was mildly frustrated that I had to purchase so many household essentials (such as paper products and soap for bathrooms and dishwasher). But those are minor items. All in all a good value for a great place to stay. Three of my girlfriends and myself used this rental as a girls getaway. I booked the rental on my own without the girls seeing what I rented. Needless to say, they were more than impressed. It is a beautiful vaction rental with an amazing view from the livingroom to the patio. The lake is quite warm. We made good use out of the provided paddle boats. If you book this vacation rental, you will not be dissapointed. The only thing that I would reccomend is that you know before hand that you have to bring your own bricketts for the BBQ, and we had to buy toilet paper and dish soap. Besides that, everything was perfect. This is such a nice review as was the first. Since we don't always hear from our guests, we are always pleased to know that they have enjoyed themselves. The house was fantastic! Looked like they had been doing remodeling and everything was turning out wonderfully. The fire pit was so fun with the kids and it already had "seats" of logs and chopped wood for us. The paddle boat was an exciting bonus for us city people, I even went out on a rainy day with my youngest. We had the feeling of seclusion even though we were very close to town and there were neighbors all around. The indoor sports center was probably my biggest surprise! I knew it was there of course but I did not know we as a family would enjoy it as much as we did. There was not a day that we did not spend time in it. I did think the kitchen was a little understocked, some of what I thought to be basics were missing such as no baking dishes, bbq tools, kid friendly glasses etc. Overall Fantastic time and would love to return again next year! I really appreciated the great ideas on the baking dishes, BBQ tools and kid friendly dishes. I am going to add those items right away. At the Deer Lake property, enjoy Kayaking/canoeing, swimming, fishing, boating/water-skiing. (Power boats limited to times posted at public access). You can even bring your horseshoes and croquet set for some fun lawn activities. Camp fire pit available as well. Enjoy wine tasting, shopping, site seeing and much more. You can even take in a movie at Langley's Clyde theater or the Blue fox drive-in. Come see what this place and Whidbey Island has to offer.